This delightful holiday let is a Victorian terraced house within easy walking distance of the marinas (only 400 metres from Shepards Wharf) and Cowes town centre. The quality of the furnishings and the comfort provided make this a fabulous holiday home for a self-catered holiday on the Island with friends and family. Wifi access. Welcome basket on arrival. Fabulous garden on two levels - great for alfresco dining. 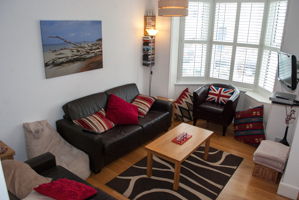 Regatta Cottage is furnished to provide you with all you need to maximise the comfort and enjoyment of your holiday on the Isle of Wight. Regatta Cottage has been lovingly restored to a very high standard throughout. This house is decorated in a contemporary and uncluttered style with wooden floors throughout the lounge and dining room. a spacious open plan living room with TV, DVD and wireless broadband connection. 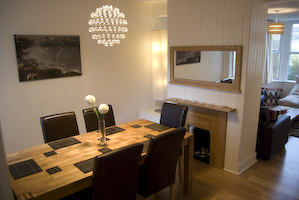 a lovely dining room that can seat 8 people at the large oak dining table. a good size kitchen with fully fitted modern units and a dishwasher. two bathrooms - a large bath/shower room on the ground floor and a shower room on the first floor. two double rooms - both rooms can be made up with either double or twin beds. a bunk bed room with full size quality bunks. two single guest beds that can be added to the double rooms to turn them into triple rooms. a lovely garden with a seaside feel. 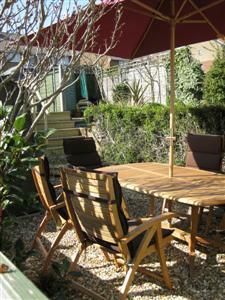 The garden is on two levels with garden furniture, including a BBQ, a hammock and a couple of deck chairs. ©Regatta Cottage 2010 all rights reserved.